If you have spoken to me recently, I have probably told you about my new book obsession. I have a fairly long drive to work, so I decided to be a nerd and find an audio book from the library to keep me company in the car. As I glanced over the options, one caught my attention. 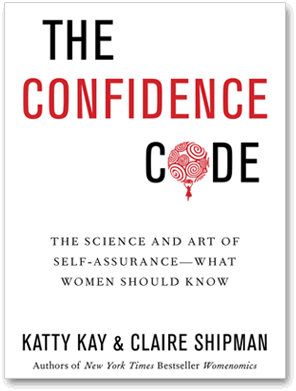 It is called The Confidence Code by Kattie Kay and Claire Shipman. While this book is focused mostly on women, it could be a helpful book for men to read too. Actually, it would be amazing for men to read. Because then they could get a glimpse into what it is like for women in the workplace, in relationships, and what it is like inside a woman’s head in general (if you can handle that). This book addresses the inherent confidence issue with which women struggle. Those of you who were around me at all this summer most likely heard me preach about how great Daring Greatly by Brené Brown is – this is a similar kind of book. What Brené Brown did for vulnerability, these women do for confidence. It is a scientific, psychological, deep look at what causes, effects, destroys, and encourages confidence. Most people probably know that men just naturally are more confident than women. That is not just an observation or opinion, it’s a fact. This confidence can often be unwarranted – but that is beside the point. This book encouraged me to consider why I am afraid to do what I want to do, what has caused me to doubt myself, and the areas of life where I want to be more confident. My fear at the beginning of the book was that it would be a man-hating blame game accusing men of destroying our confidence. While I am sure there are situations where this has happened/is happening, I know that in my life I am the most guilty of diminishing my own self-belief, not the men around me. My best friend told me I need to stop saying “I think” so much in my blog. If you read over this again, you will not find that phrase at all. I had to go back through and remove it – multiple times. “It’s your blog, we know it’s what you think.” It made me realize that it was a qualifier – a lack of confidence – in what I was saying. I didn’t want to come across too strong, stating something as a fact. All that to say, I realized how badly I needed this book. The authors encourage action – just do it – like Nike. They encourage us to be brave, to believe that we are competent (incompetence is rarely the issue, btw), and just as qualified as anyone else out there. Whether we are called to the boardroom, the home, or the blogosphere (cue my panic attack here), we are able and capable and need to be confident in ourselves. I wondered as I read the book, how does this relate to our faith? It is not written with any connection to faith or religion at all, but there is a clear link. One of their main points is that confidence is more important than competence. This runs contrary to what we often believe about ourselves. Whether in our career or our relationship with God – we have a hard time understanding the idea that maybe it isn’t about our ability at all. Maybe, just being alive and redeemed by God means that we can have confidence. It isn’t about our competence, in the workplace or at the foot of the Cross. We can have confidence in who God says we are – alive, redeemed, whole, GOOD. If you get one thing from reading my blog, once, twice, or every post, I hope it is this – God created you and spoke “IT IS GOOD” over you. You don’t need to earn anything; you can have confidence in just being you. I’d highly recommend this book. I don’t just think it’s good – it is. And I would also encourage you to consider where your confidence comes from – do you base it on your performance and competence? Or is it based on what God says about you – that you can have confidence because He loved you first.